“The silent earth sings with the voice of its own beauty. You gaze upon the earth and you behold its loveliness, you observe its fecundity, you marvel at its secret powers, how it conceives its seed, and how it may bring forth offspring different from what was sown. As you reflect on these things you long to question the earth. Your research is an asking of the questions. Wondering and awed, you search for the truth, you probe it patiently. 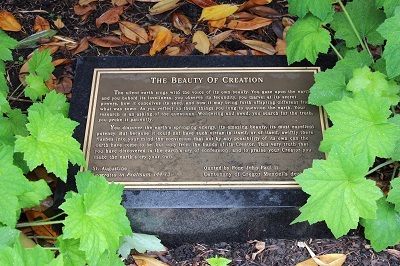 This is on the ground, tucked away under plants to the right of the statue of Gregor Mendel near the entrance to Mendel Science Center. Photograph by Alice Bampton, Communication and Marketing Dept.